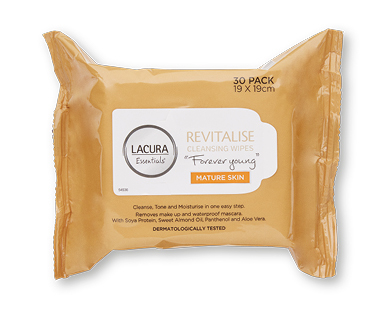 LACURA® Essentials Revitalise Cleansing Wipes are specially formulated for the needs of mature skin. They contain soy protein to help support skin regeneration which may reduce the visible signs of aging. With the additional benefits of sweet almond oil, panthenol your face will be cleansed, toned and moisturised in one easy step. Use everyday to remove make up including waterproof mascara. Your skin will be left feeling soft and smooth.